Description of Central Idaho- Most of Idaho’s human population lives in the eastern, southern, and northern part of the state. Central Idaho is a mass of mountains, one ridge after another. Parts of these mountains have been given various names, such as the “Lick Creek Mountains” or the “Bighorn Crags., but they are more generally just called the “Salmon River Mountains;” and more to the north, for no geological reason, they are called the “Clearwater Mountains”. There are no cities in central Idaho. A few towns such as Salmon, Challis, Stanley, Grangeville, and Riggins are on the edges. Inside the mountains, there are just a few small places of habitation such as Shoup, Yellowpine, Dixie, and Elk City. Unlike the Greater Yellowstone Ecosystem, there are no paved highways, few farms or ranches, and little livestock grazing in most of the core area. 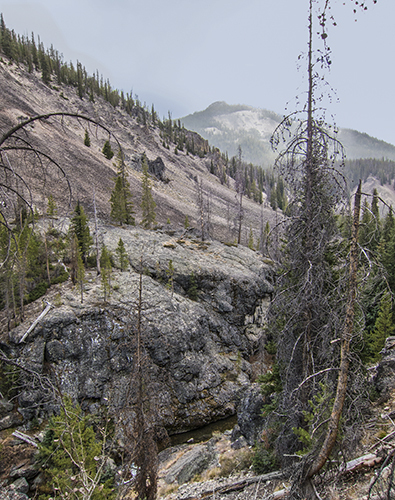 There are few flat spots except the narrow canyon bottoms, and a few mountain valleys and plateaus such as the Sawtooth Valley and the Chamberlain Basin. A good portion of central Idaho is protected within the Frank Church, Selway/Bitterroot, Sawtooth, and Gospel Hump Wilderness areas. There are many more smaller, and unprotected, roadless areas (on the order of 50 or 100-thousand acres each). The areas that do have roads were developed mostly for timbering and mining, and have few permanent residents. Central Idaho has proven to be excellent wolf country, and due to its primitive nature there have been fewer human-caused wolf deaths and livestock depredations. Idaho Fish and Game has declared war on the wolves in the upper Selway area due to their perception of too many eaten elk.